Featuring New Wikileaks Stratfor GI File releases on Turkish group behind the attack! According to Reuters, a self-proclaimed Turkish Marxist group has claimed responsibility for the suicide attack on the US embassy in Ankara, Turkey. Ecevit Sanli, as he was identified by Istanbul police, died after detonating his bomb near the embassy's Gate No. 2 around 1:15 p.m. (6:15 a.m. ET) Friday. So, too, did the Turkish guard -- described by U.S. Ambassador Francis Ricciardone as a "hero," and identified by Turkey's semi-official Anadolu News Agency as Mustafa Akarsu. This is a fast breaking story so I am publishing what I find when I find it in the hopes that these snippets will contribute to a better understanding of what has happened and why. First I checked with Wikipedia to get a general read on this group and found an very good article that had already been updated to include yesterday's events. 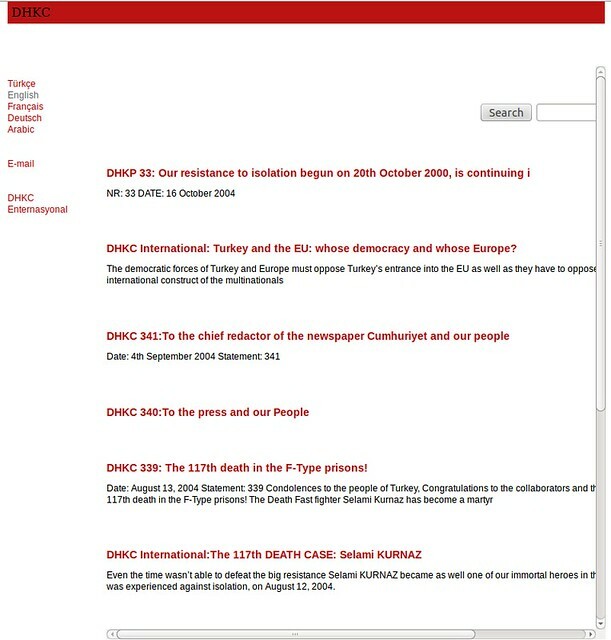 The organisation was originally formed in 1978 by Dursun Karataş as Revolutionary Left (Turkish: Devrimci Sol or Dev Sol), a splinter faction of Devrimci Yol ("Revolutionary Way", also known as Devrimci Yol), which splintered from the People's Liberation Party-Front of Turkey (THKP-C), which in its turn was a splinter of Revolutionary Youth Federation (commonly known in Turkish as Dev Genç). A 1994 factional infighting within Dev Sol resulted in two factions: the main group led by Dursun Karatas was renamed DHKP/C, while Bedri Yağan created a new THKP-C (not to be confused with the original one). In all cases of "Parti-Cephe" (Part-/Front) names, "Party" refers to the group’s political activities, while "Front" is a reference to a group’s military operations. Theoretically they are separate entities. The group espouses a Marxist-Leninist ideology and holds an anti-U.S., anti-NATO positions. It considers that the Turkish government is under the control of Western imperialism and seeks to destroy this control by violent and democratic means. It finances its activities chiefly through donations raised in Turkey and Europe. DHKP/C added suicide bombings to its operations in 2001, with attacks against Turkish police in January and September of that year. Security operations in Turkey and elsewhere have weakened the group, however. DHKP-C did not conduct any major attacks in 2003, although a DHKP/C female suicide bomber Sengul Akkurt's explosive belt detonated by accident on 20 May 2003 in Ankara, in a restroom, while she was preparing for an action. On 24 July 2004, another mistaken detonation, on a bus in Istanbul, occurred, killing Semiran Polat of DHKP-C and three more people and injuring 15 others. On 1 July 2005, Eyüp Beyaz of DHKP-C was killed in Ankara in an attempted suicide bombing attack on the ministry of justice. In late February 2006, female member Fehriye Erdal was convicted in Belgium, while under house arrest. However, shortly before her conviction she escaped and still has not been found. On 29 April 2009, Didem Akman of DHKP-C was wounded in her attempt to assassinate Hikmet Sami Türk at Bilkent University right before a lecture in Constitution Law. Akman and her accomplice S. Onur Yılmaz were caught. In December 2011, high-school teacher Meral Dönmez and university student Gülşah Işıklı held up pieces of cardboard out of the window of a lawyer's office with the text, "We do not want a rocket shield, but a democratic high school". For this, they were convicted in October 2012 to 6 years and 8 months imprisonment for "committing a crime on behalf of a terrorist organization [DHKP-C] without being a member." On February 1st, 2013, a suicide bomber suspected to be a DHKP/C militant blew himself up at the US embassy in Ankara, killing a Turkish security guard and wounding several other people. Istanbul police identified the bomber as Ecevit Şanlı, a member of DHKP/C. Then I tried to check the groups website, http://dhkc.org, and that's when things got interesting. The website turned out to be a parked domain, owned but not representing any group or person. So then I checked the WayBack Machine @ archive.org and found that dhkc.org was apparently the groups website between 2002-2008, but then the WayBack Machine has no more snapshots of it until 2011, when it shows up again as a parked domain. for western businesses in Turkey. The Revolutionary People's Liberation Party- Front is a leftist Marxist radical organization that was founded more than two decades ago. There is no evidence that the group has carried out or attempted to carry out any attacks since mid-2006, when members of the group engaged in an armed firefight with police in Istanbul. The group's tactics have typically included small-scale bombings and small-arms attacks that would be easily replicated by militants with little sophistication--there is no reason to believe the group would stray away from these tactics. There is also no reason to believe that they have developped additional capabilities to carry out larger-scale attacks. While many members of the group have been arrested over the past decade, it appears that there is still a core group of the organization that does have experience planning attacks and could potentially train others to engage in such behavior, thus there may be a level of credibility to the reports. However, it is also important to note that in addition to the alleged threats to attack Coca-Cola and other western business targets, the group was also reportedly attempting to assassinate Turkish Prime Minister Recep Tayyip Erdogan. Numerous similar plots to assassinate Erdogan have emerged in the media over the past several motnhs, but have later been dismissed as attempts by rightist and secular opposition groups and movements to discredit and threaten the ruling government of Erdogan's Justice and Development (AK) party. While it is not clear that this reported plot to attack Coca-Cola is a similar attempt to smear the government, the use of the leftist Revolutionary People's Liberation Party-Front as the culprit behind the alleged plot would fit earlier trends seen in the alleged plots to assassinate Erdogan. Additionally, the inclusion of western businesses in the alleged plots would further the notion that Erdogan is not able to protect himself, the people of Turkey or the investors who have come into the country. I read the report. Companies were notified or should have been last Friday. It appears pre-operational surveillance was conducted and as noted below attempted penetration through employment. (U) "On 05 March 2008, Turkish authorities arrested three (3) individuals associated with the Revolutionary People's Liberation Party/Front (DHKP/C), a Marxist, anti-western splinter group of the Turkish terrorist group Dcv Sol. During the course of the investigation, authorities learned the group may have been targeting a number of U.S. companies, including your own- It is requested your organization conduct a security assessment, with specific emphasis on background investigations, of employees who have sought employment with your organization in Turkey within the past year." (Ti) ETIU Ii provides the following unclassified paragraph as background on the identified terrorist group: "the DMKP/C is a Marxist, anti-western splinter group of the Turkish terrorist group Dev Sol. DHKP/C is designated as a Foreign Terrorist Organization by the Department of State DHKP/C ideology is similar to that of other radical Turkish leftists. The group sees the Turkish government as a fascist regime, controlled by the imperialist forces of the West. The group seeks to destroy these U.S./Western influences through violence and Marxist revolution. The group primarily operates in Turkey and raises funds in Europe "
Three members of the DHKP-C [Revolutionary People's Liberation Party-Front] alleged to have been planning to assassinate Prime Minister Recep Tayyip Erdogan using a "radio controlled toy car" when he got to his home in Uskudar, have been apprehended. The suspects, it is alleged, had planned to rake the convoy with Kalashnikov rifles in the confusion following the detonation of the bomb close to Erdogan's vehicle. During a search of their safe houses police seized 35 kg of ammonium nitrate used in bomb making, one Kalashnikov rifle and radio controlled toy cars that had been converted into explosive devices. Teams from the Istanbul Police Intelligence and Counterterrorism units found clues to a plan to assassinate Erdogan following a raid last month. On studying some of the documents they seized in that raid the police learned of the assassination plan and put surveillance on the organization's members. A raid was carried out four days ago when the hit team met up in Beylikduzu. Organization members Ozgur Baris Ozcelik, Deniz Sah and Zeynel Kalanc met up in a restaurant and were apprehended by police from the Intelligence and Counterterrorism branches. Furthermore, police searched the safe house being used by the suspects in Kucukcekmece and they discovered the details of the plan to assassinate Prime Minister Erdogan. A search of the house revealed schematics for the hit, an action plan, a Kalashnikov rifle, a Baretta pistol, 35 kg of ammonium nitrate used in making bombs and some radio controlled toy cars that had been converted into explosive devices. Deepening their investigation the police stated that the hit team had been working to carry out an act of terrorism as soon as possible after the capture last month of Asuman Akca, who is the DHKP-C's commander for Istanbul. The suspects had planned to carry out the assassination when Erdogan was arriving at his home in Uskudar and that they were going to rake Erdogan's convoy with guns in the confusion after they had detonated the radio controlled toy cars. Police stated that Ozcelik and Sah were already on record with the police and that they had claimed to be construction workers while the third suspect Zeynel Kalanc had aided and abetted them. Following questioning by Istanbul CTU the suspects were arraigned before the courts in Besiktas were they were formally arrested by the duty court and sent to remand prison. ANKARA, Turkey (AP) - A Turkish news agency says police have foiled an alleged plot to bomb U.S. companies in the country. Police arrested three suspects belonging to a leftist militant group during a raid in Istanbul, the Dogan agency reported. Authorities seized a remote-controlled toy car allegedly being prepared to be used in a bombing. Police also seized a list of U.S. companies that the DHKP-C group was targeting, including Coca Cola, Pepsi and Citibank, Dogan reported. 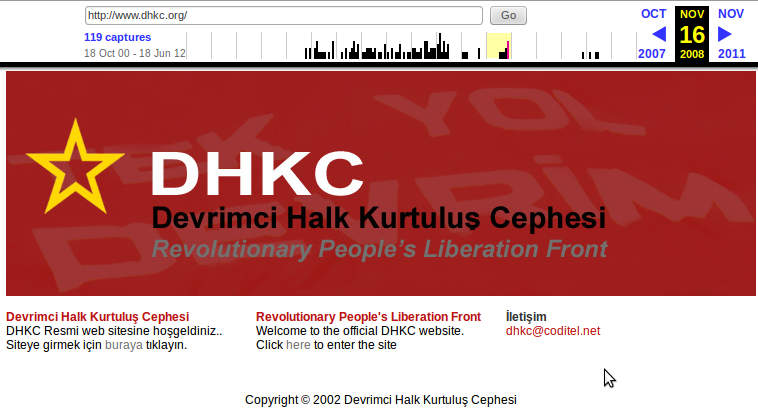 The DHKP-C is listed as a terror group by the U.S. and EU, and has been active since the 1970s. More as I get it on this fast breaking story, check back!! !